The past few months have seen a number of new birds coming through to the show for training. 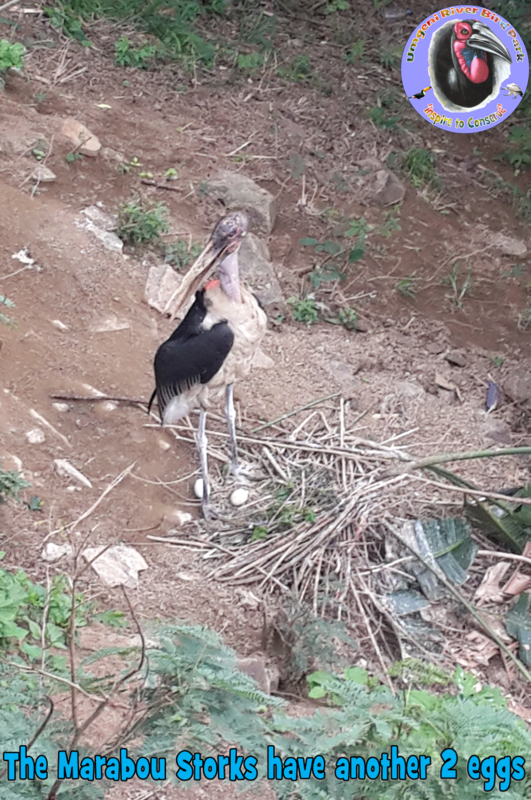 Some of these include Guira Cuckoos, Crowned Crane, Spotted Eagle-owl, Scarlet Ibis, Barn Owl and Blue & Gold Macaws. Their training is going very well and you will be able to see them making their show debuts over the next two months. We are slowly introducing them to audiences so if you are lucky to make get to see them in training on stage after the shows and get to be some of the first people to see these new stars on stage and be part of the audience. 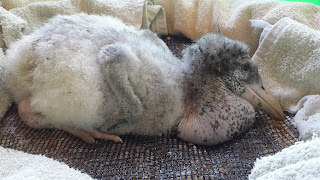 Whilst most of the birds we work with in the show are hand-reared, it is one thing for them to work with the trainers every day back stage and on stage. When we bring an audience in or even more than 5 people, the birds can take a while to settle down. 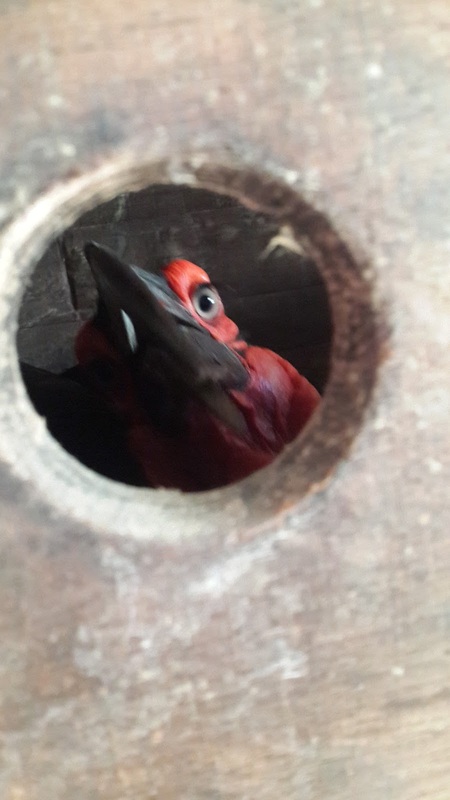 By the time our birds are in shows, many of them have been in training for up to 6 months backstage before we take them onto stage to continue with the training. It is only when they are performing their routines well that we begin to introduce them to the public in smaller shows. After they have settled into their routines with small crowds, we then start to bring them out with bigger groups until they are working well in any situation. 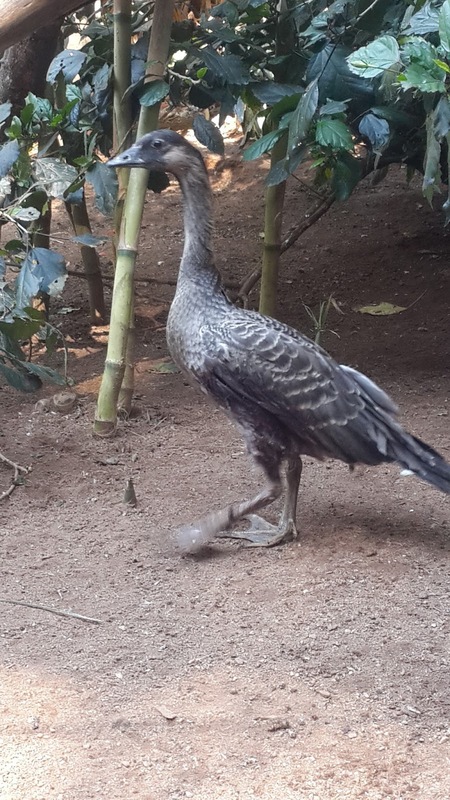 The time this take varies with each bird but can take another 6 months with some of the more nervous birds. 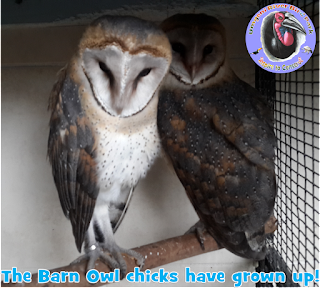 All this means that by the time many of you see our show, up to a year of intensive training has gone into each bird. It also means that it is not a quick process to get new birds on stage and into a show and also makes every bird you see special. So the next time you come and see the show, remember how much work has gone into the training of each bird and how hard they work for you. "Bug" our beautiful Spotted Eagle-owl in training for the show. 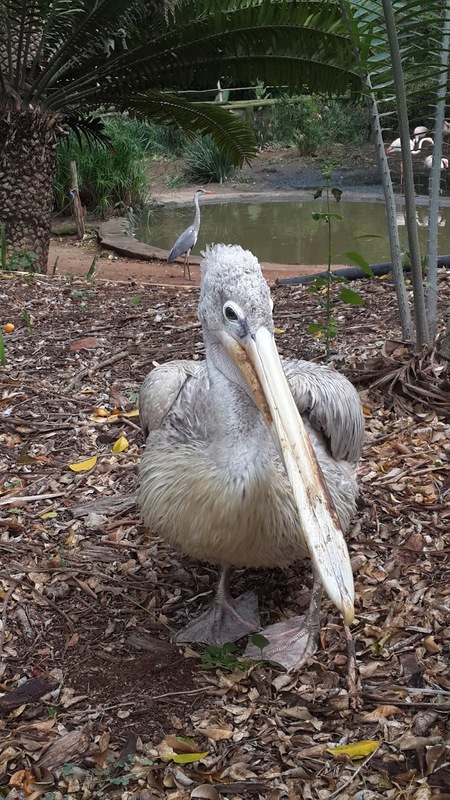 The park has been packed this week as schools around the country are on holiday and we just wanted to share some pics of updates since our last post. 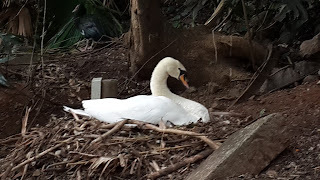 Don't forget there is always something new to see and do at the park so come on round and see for yourself what we have been up to. 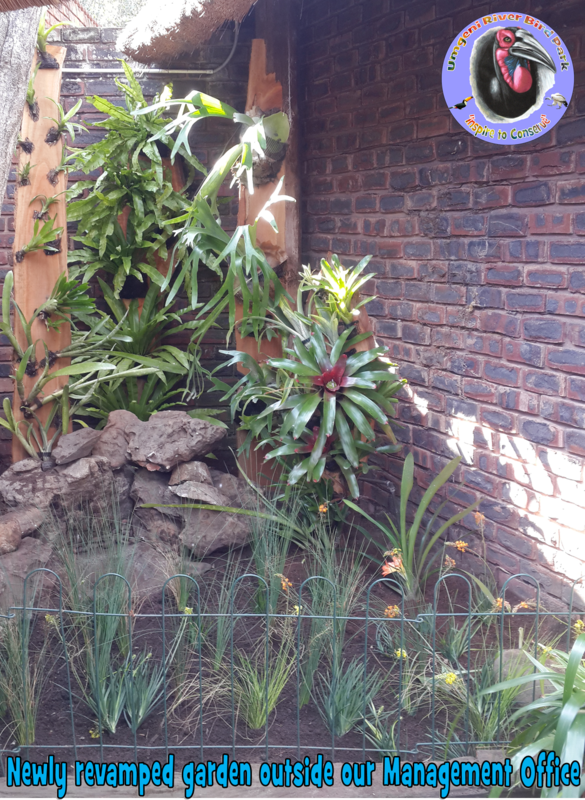 Also don't forget to check out our new website at www.urbp.co.za and let us know what you think. 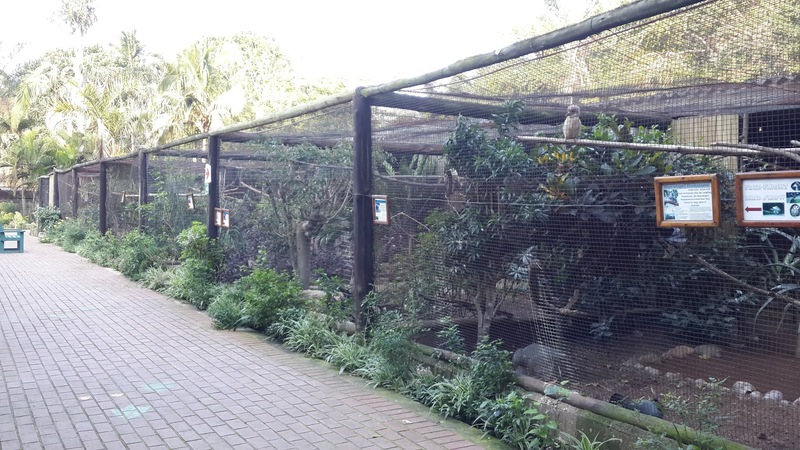 With kids around the country going on holiday today, why not make a trip to the Umgeni River Bird Park? With almost 800 birds from 200 species, there is something for everyone. 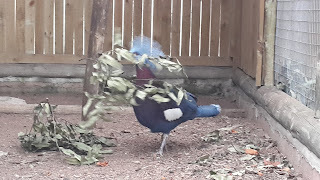 Don't forget the free-flight bird show at 11am and 2pm every day during the holidays. There is also the Cockatoo Cafe, playground for the kids and also lots of babies and new birds on display. So if you haven't been to the park for a while, make a trip down and see the new additions and renovations that have been going on. 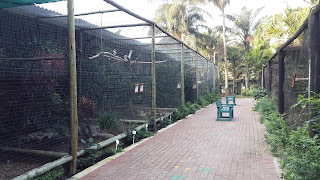 The park is open from 9am to 5pm every day and entrance fees are only R50 for Adults and R30 for Children (4-12 years) and pensioners. 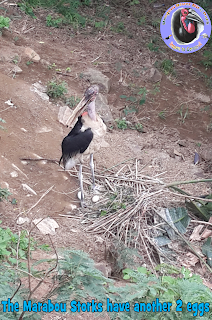 If you are lucky enough you may also get to see our little Marabou Stork at the Show Auditorium just before the start of each show so come down the park these holidays and be inspired to conserve. Our new website is up and running so check out www.urbp.co.za and let us know what you think. We have stream-lined the look and feel of the site and will be adding more content that our visitors have asked for. It’s been a long time since our last post because there has been a lot happening at the park recently and not much time to catch up. 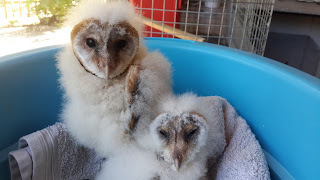 Winter is traditionally a very busy time for us as we prepare the park and birds for the breeding season which normally starts at the beginning of September. 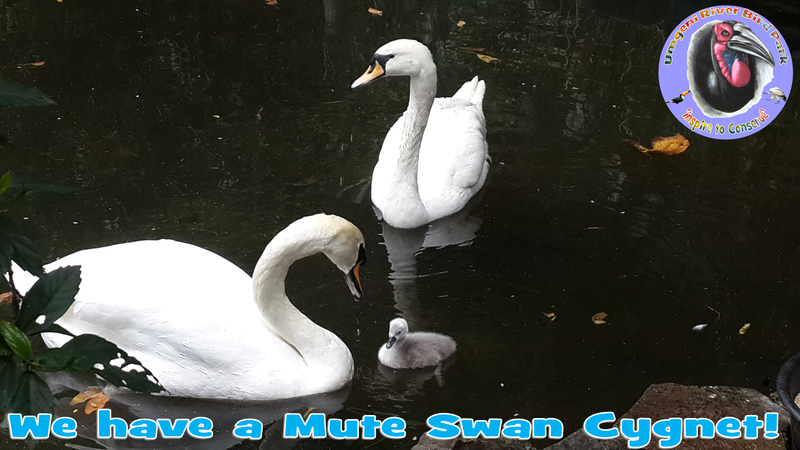 I say usually because we have had more winter babies this year than ever before! 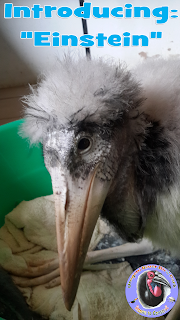 As well as various Lorikeets, we have also welcomed 2 Barn Owl babies, 2 Marabou Stork chicks (1 of which sadly died at 4 days old), 2 Spotted thick-knee chicks, 2 Guira Cuckoo babies, 3 African Grey and 3 Senegal Parrot chicks amongst others. There are also many more birds sitting on eggs which are due to hatch any day now including our Mute Swans, Southern Ground Hornbills and a number of different parrot species. If this trend continues, it could be our best breeding season in many years. As well as the new babies we have, there are also a number of new birds which have been donated to the park and have joined the collection. These include a Blue-headed Conure, 3 African Grey Parrots, 2 Sun Conures, a Wood Owl, 2 White-faced Owls and a Brown-headed Parrot. 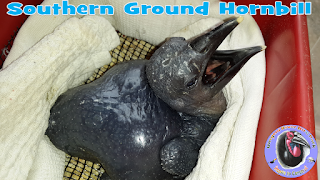 These birds will join our captive breeding programs in many cases, or, like the African Greys, be introduced to the communal flock which we do not breed from. Visitors in the past 3 weeks have also seen a lot of construction on the go around the park. Our “Pheasant Corridor” which is the main pathway down to the show arena had a revamp on one side past year after the construction of the storm-water system destroyed some of the enclosures. We are now in the process of rebuilding the opposite side of the pathway which backs onto the Marsh Aviary. 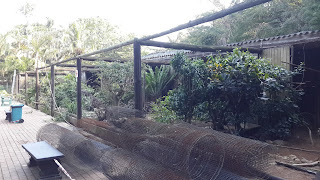 This has been a tricky project as the enclosures shared a wall with the marsh aviary so a temporary fence had to be erected in the aviary to allow us to demolish the enclosures safely and not have birds from the aviary escape. 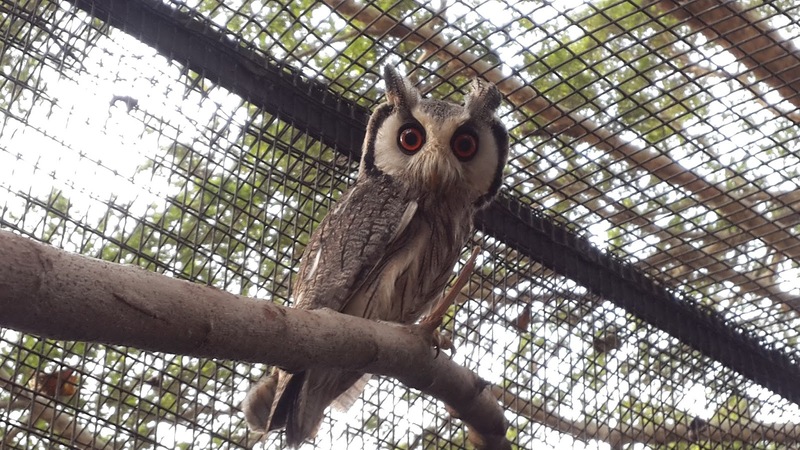 These new enclosures will house a variety of Owls including Spotted Eagle-owls, Wood Owls, White-faced Owls and Barn Owls. 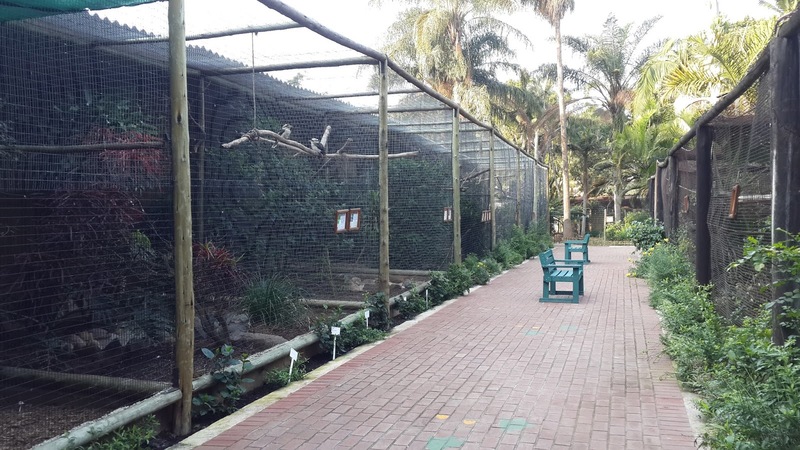 There will also be a new enclosure for our African Harrier-hawks where the Barn Owls currently are. 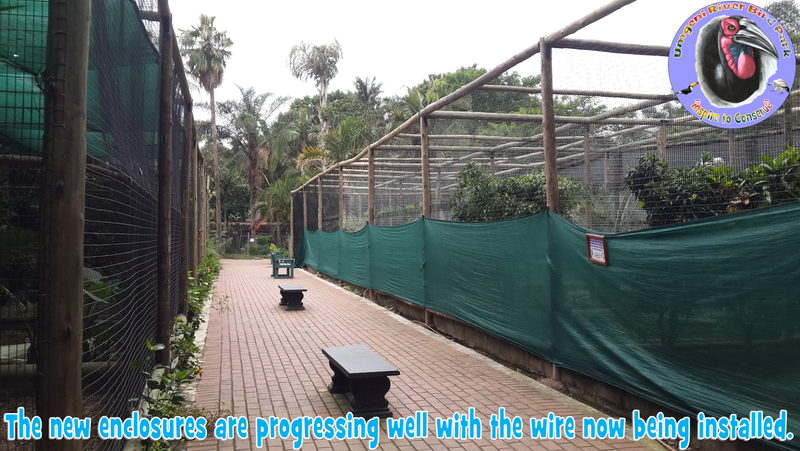 The Blue-wing and Laughing Kookaburras will also be moving alongside the owls in this newly revamped section. 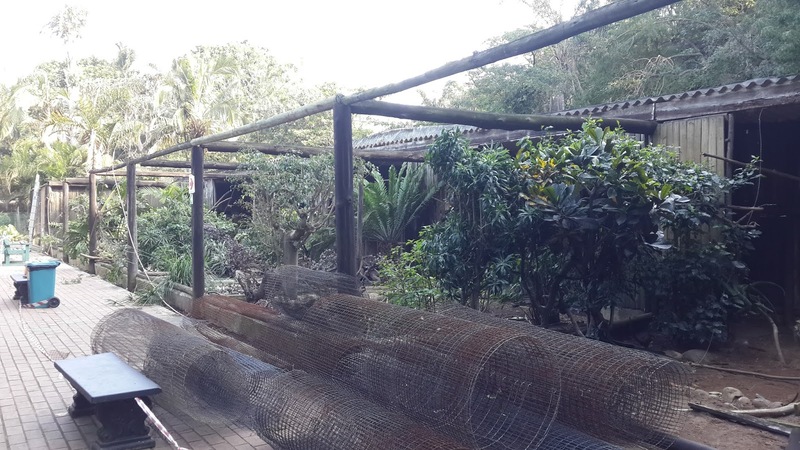 There are also plans to completely redevelop the Marsh Aviary and we are waiting for the materials to arrive to start this massive project. It will see the aviary almost doubling in size, have new ponds and pathways and also a natural reed-bed bio-filter for water purification. 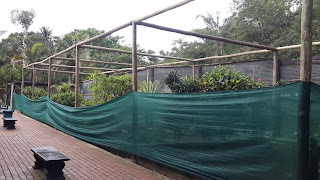 There will also be a number of new water loving birds introduced into this aviary. 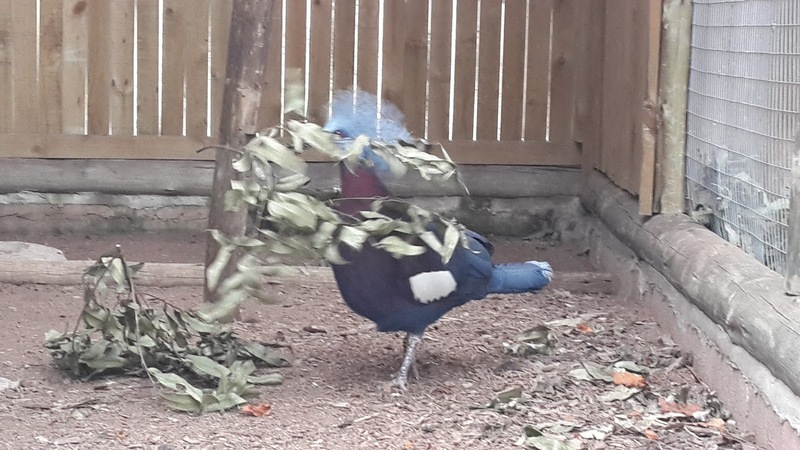 We aim to have the new Pheasant Corridor enclosures completed by the end of October and the Marsh Aviary completed by the start of the Festive season (depending on arrival of materials). There are also a number of smaller projects underway behind the scenes which will be in place by the festive season so we hope to see you coming back and seeing all the changes by the end of the year. We also would like to take this opportunity to thank you for your patience during this time and can assure you it will be well worth the inconvenience at the end of the day. Finally don’t forget to like us and follow us on our various social media platforms. These are often the quickest and easiest way for us to get news form the park out and also reveal pics of our new arrivals. Also please do not hesitate to comment on our social media platforms to let us know what you think, what you like or don’t like, or what you want to see more of. It is only through this feedback that we can make the park the best it can be for you and for our birds. We would like to let all our visitors know that due to road-works and replacement of the entire road surface of Riverside Road which runs outside the park, access to the park will restricted between Thursday 26 March and Friday 24 April. You will be able to access the road and park but there will be delays and possible detours. We apologise for the late notice but we were only informed this morning Thursday 26 March by the roads department. Please take the potential delays into account when planning your visit to the park over the next month. For information about delays and detours please phone the Ethekwini Roads Provision Department on 031 311 5764/5. 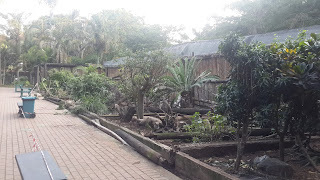 Alternatively you can phone the park on 031 579 4600 to find out the latest situation. Starting from the beginning of April, we will be bringing some new features and series to our social media sites. 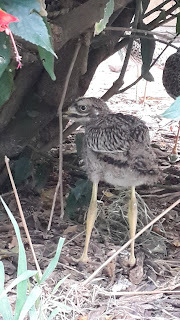 Every week will see a new theme and these will include: Bird of the Month, Training blog, Education articles and also new pics from the park. The themes will carry across all our social media platforms with different sites containing different aspects of the theme so we encourage you to sign up to all our sites to get the most out of the new plans. We also encourage you to comment on our sites and give us feedback as to what you enjoy, what you would like to see more of – or less of and also what features we can add to our sites to keep you coming back. Don't forget you can find us on Facebook, Twitter, Instagram, Pinterest and YouTube as well as our website. Well the new year has kicked off to a fantastic start for us and our figures from 2014 show an increase of more than 20% in our visitor numbers! We want to thank everyone for your support over the past 30 years and for continuing to support us over the years. There is lots to look forward to in 2015 with new enclosures, new birds and more improvements coming to the park. 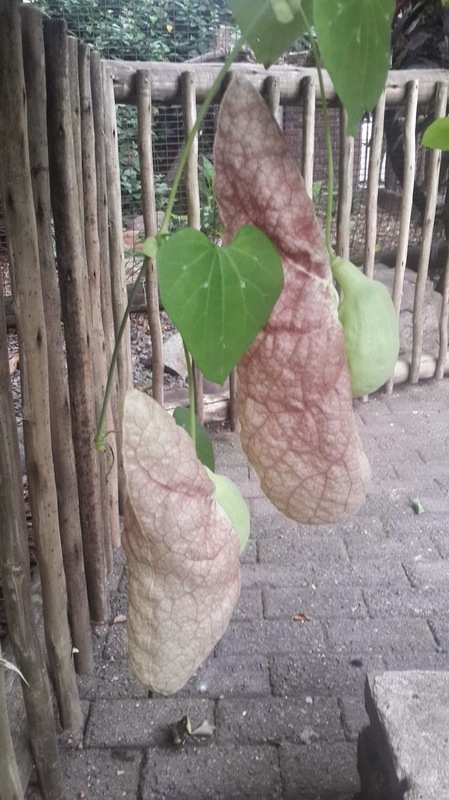 One feature which is slowly coming back to the park is the original Giant Dutchman's Pipe (Aristolochia gigantea) which used to grow in an awesome covering by our main entrance. The original structure broke in 2003 and we managed to save one of the original stems. After years of nurturing we planted it again in 2012 and at the end of 2014 it produced its first flowers. 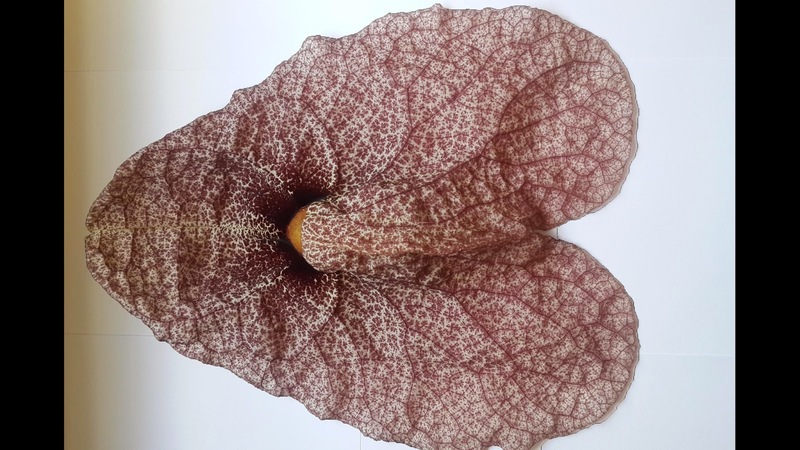 The flowers take about 2 weeks to develop and then only last a day or two once opened. The vine has now produced a wealth of flowers with more opening every day. They are huge, measuring more than 30cm and almost as wide! 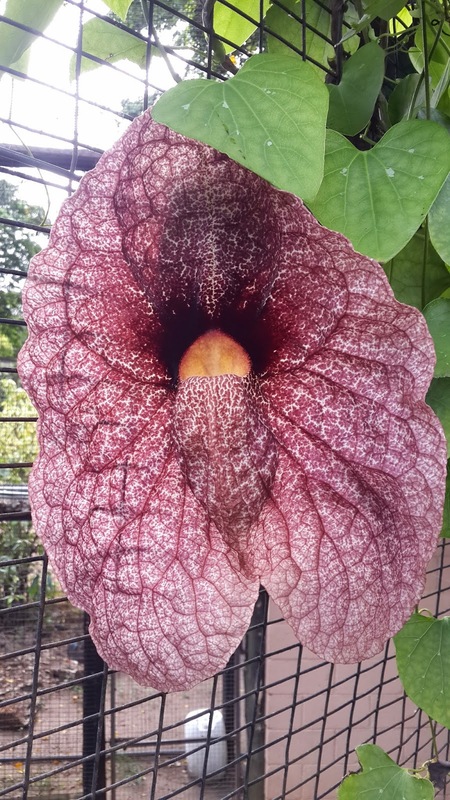 Make a point to come down to the park this weekend and get a glimpse at this incredible plant. We have made some more cuttings from the original stem and these are being nurtured and will be planted in the park over the next few months. 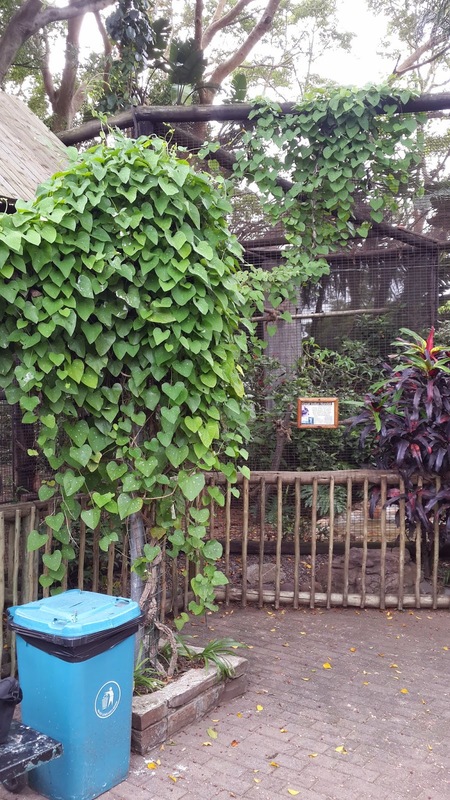 We hope over the next year to have the whole of the main entrance pathway to the park once again covered by this majestic vine and bring back one of the original attractions of the park.